Puttaparthi becoming a ghost town? One cannot be but sorry for all those poor Indians whose livelihoods have been built around the popularity of Sathya Sai Baba, no more than one can be glad that the big money-making property tycoons – including Sathya Sai Baba family members and corrupt ‘officials’ – are suffering a major setback. 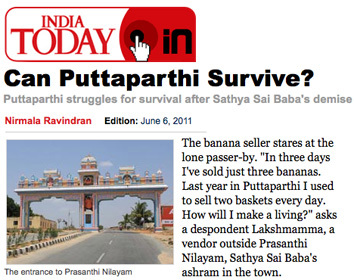 The prospects for Puttaparthi have never looked worse – and this applies also to those other resorts Sai Baba frequented – the Whitefield ashram and college complex near Bangalore – has an economy based mostly on foreign and local visitors wanting to see Sai Baba.Even Sai Baba’s summer resort town, Kodaikanal, will struggle much from the absence of foreign income in the summer month or more it was crowded with rich visitors. This entry was posted on June 7, 2011 at 7:25 am	and is filed under Cults, Gurus, Sathya Sai Baba. Tagged: Brindavan ashram, Puttaparthi. You can follow any responses to this entry through the RSS 2.0 feed. You can skip to the end and leave a response. Pinging is currently not allowed.